We couldn't make the trip in one day. We camped out on the side of the road for one night. We lived on Mr. Redwine's farm and picked cotton for him. 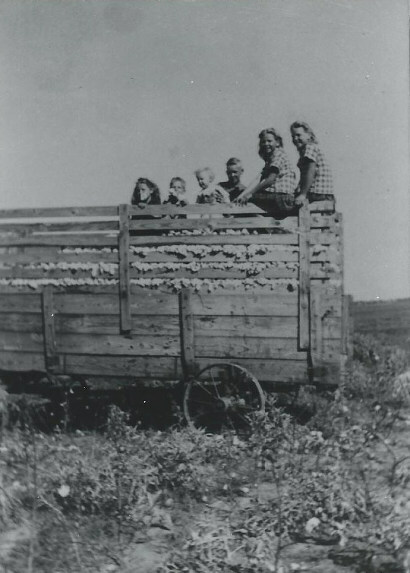 At the time Dad took the family to Seymour they were growing a "wind-proof" type of cotton to prevent the wind from blowing the fiber out of the boll. So the entire boll was picked - not just the fiber. Dad used a long cotton sack and after it was weighed, the cotton had to be shaken out of the sack into the cotton wagon. If the sack was filled tight, this was a difficult job. So Dad had my mother sew a zipper alongside the side of the sack. When it was time to unload the cotton he merely un-zipped the sack and rolled the cotton out. That was a lot easier. 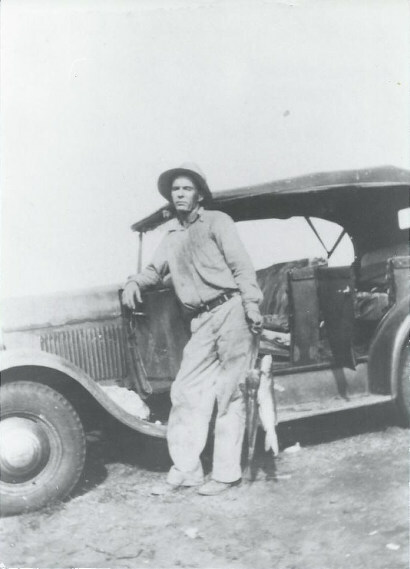 "My dad Audery Lance Suttles at 39, and his 1928 Model "A" Ford with 1932 wheels on it. Looks like he caught a good string of Channel Catfish." 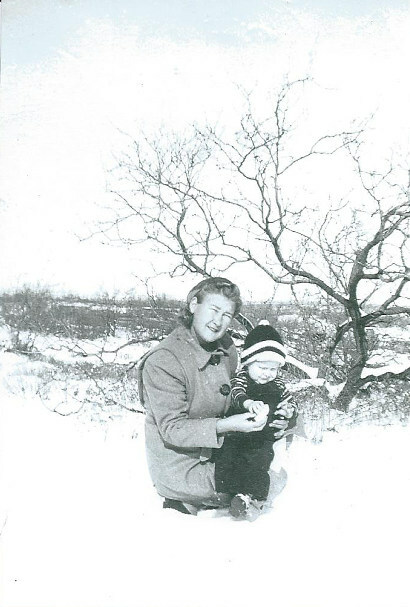 "The older boy is my brother Jack Suttles, 13 years old. I am the little guy. I was 5." 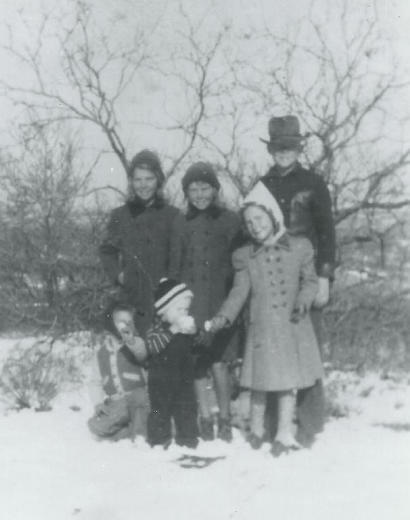 "This is a picture of all of the children in my family at that time. Left to right Bernice Lee, 8 years old, Jesse Suttles, 5, Doyle Randell Suttles, 3, Jack Audery Suttles, 13, Lillie May Suttles and Millie Fay Suttles, 10 years old twins." "This picture was taken in the front door of our house in Seymour. Fall of 1943. 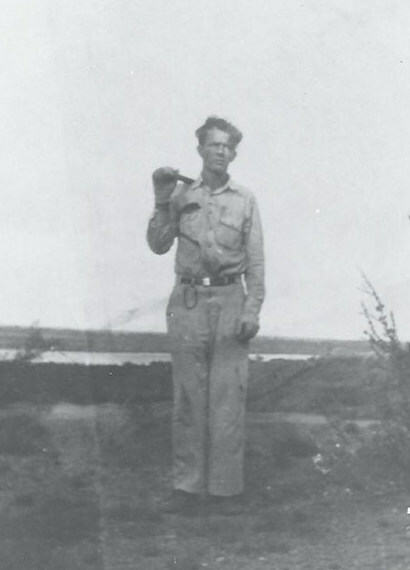 My Dad Audery Lance Suttles was 39. My Mother Ada Abagail (Dyke) Suttles was 32. We went to Seymour to pick cotton. 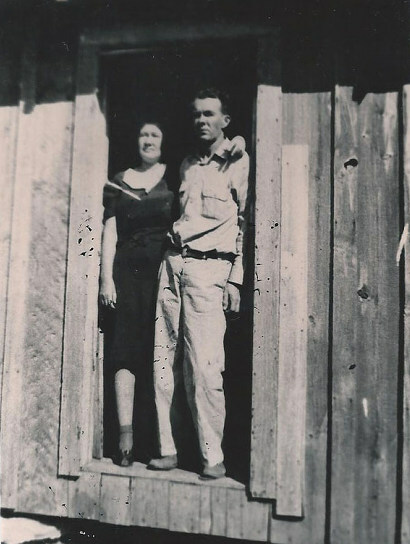 We stayed until late December before moving back to Longview." "The ones on the end (Twins) are 10 yrs old, the other girl was 8." 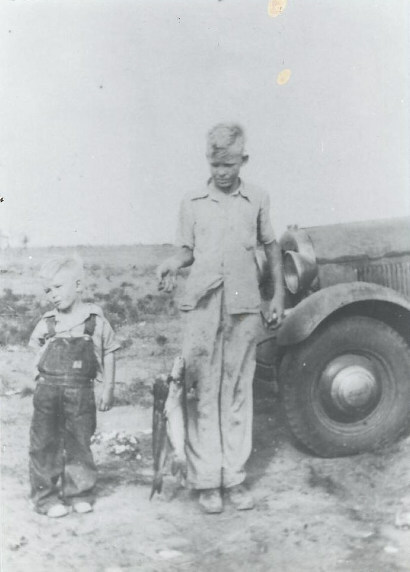 "My dad Audery Lance Suttles holding an axe on his shoulder. We used wood to heat and cook with. (The same stove.) He had been cutting Mesquite, a small spiny scrub. They don't grow very large." 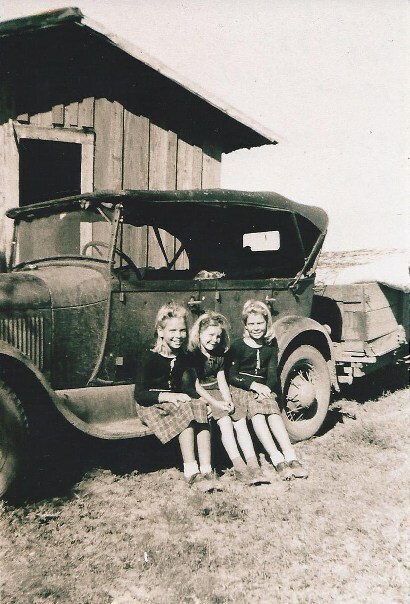 "Suttles family in Seymour just before we moved back to Longview." "The baby was 1 year old."